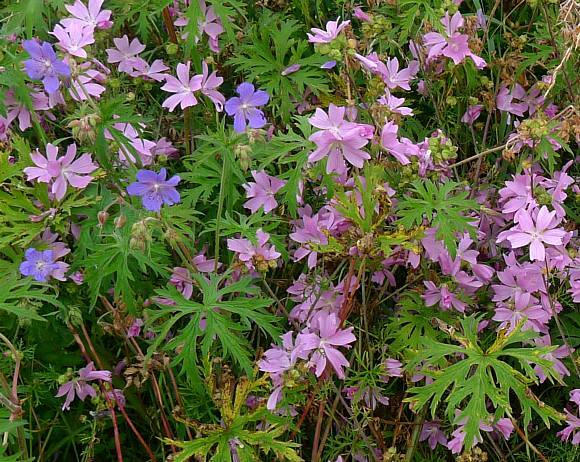 Growing amidst Wood Crane's-bill, which also has cut leaves. 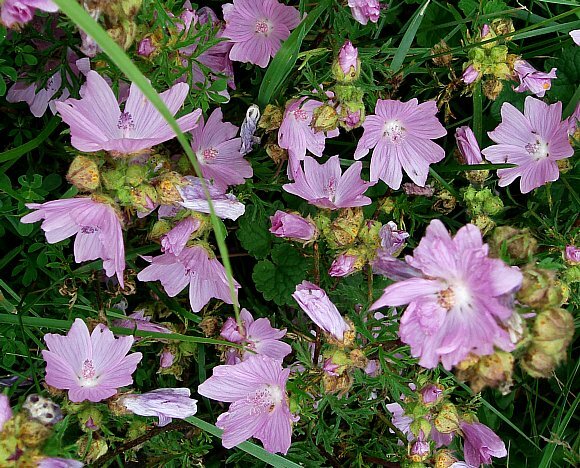 The large deeply-cut leaves here are those of the five-petalled blue Wood Crane's-bill; the leaves of Musk-Mallow are also deeply cut, but smaller and much finer (deep down bottom middle). 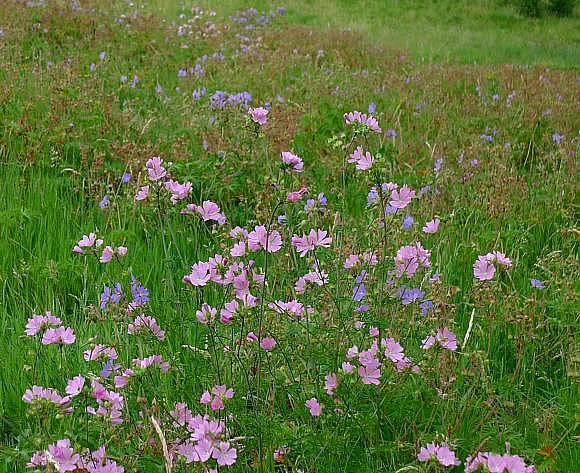 A mass of flowers growing wild, leaves in bottom right. 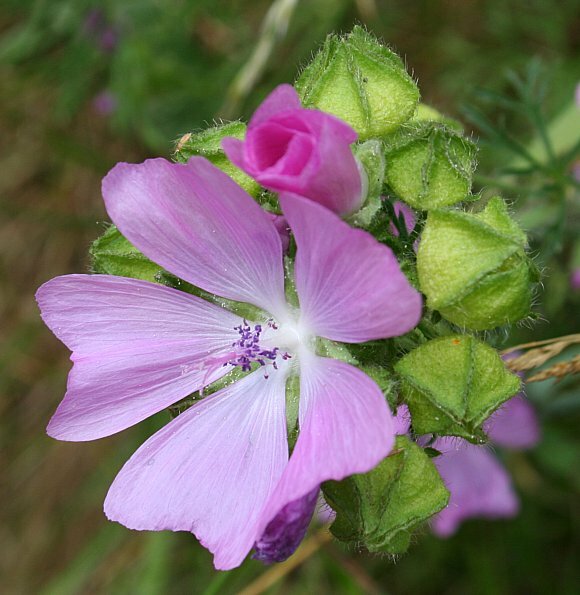 Shorter than Common Mallow growing up to only 80cm. Flowers mainly at the top, but also on side-branches up the side. 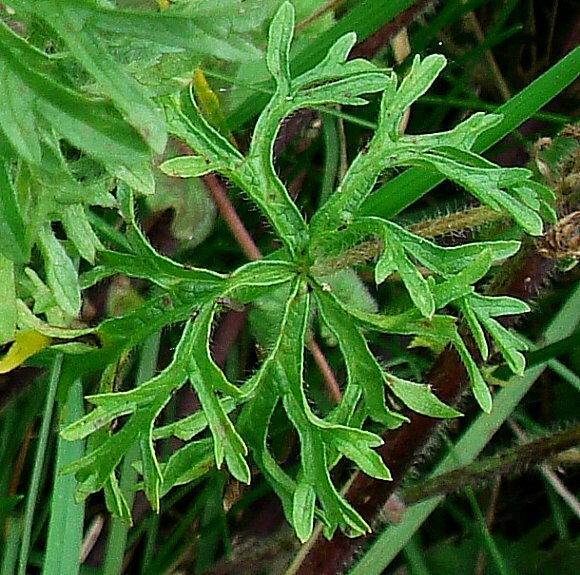 A branched plant with deeply and narrowly cut leaves not un-like those of Cut-Leaved Crane's-bill. 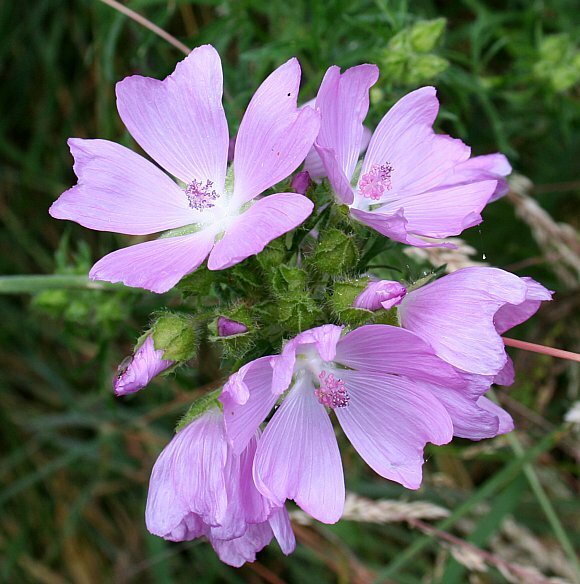 Flowers rose-pink, a lighter colour than those of the lilac to mauve flowers of Common Mallow. 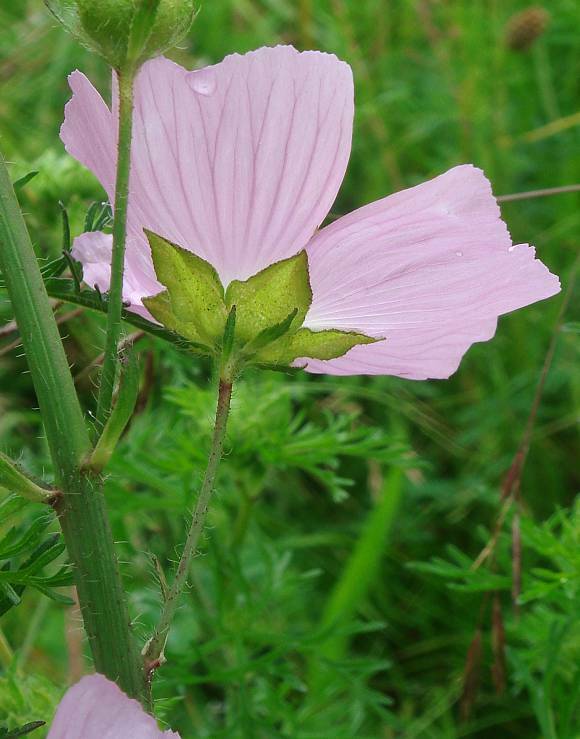 Flowers have five petals with a well-rounded notch. 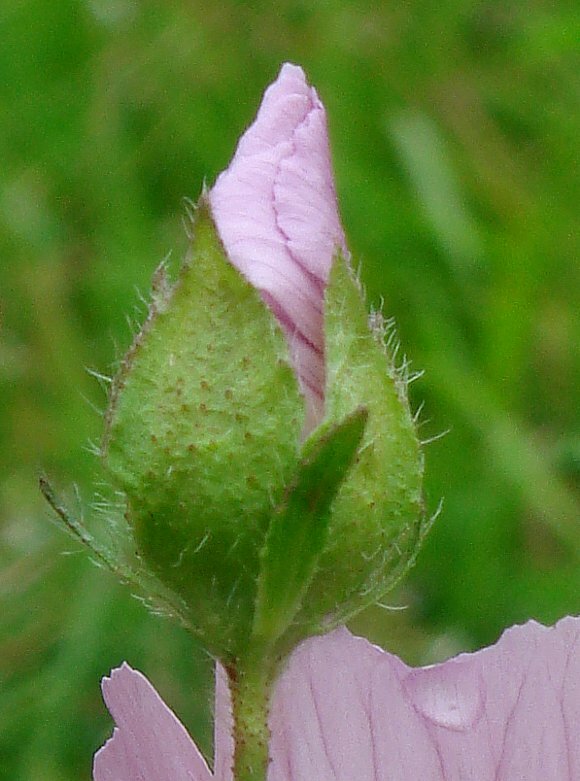 Five sepals around un-opened buds giving it a ridged appearance. 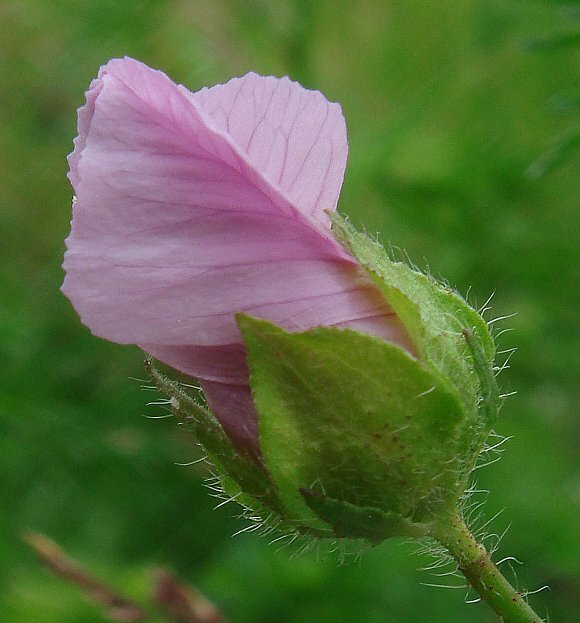 A flower with several as-yet un-opened flower buds beneath and deeply-divided leaves beneath those. 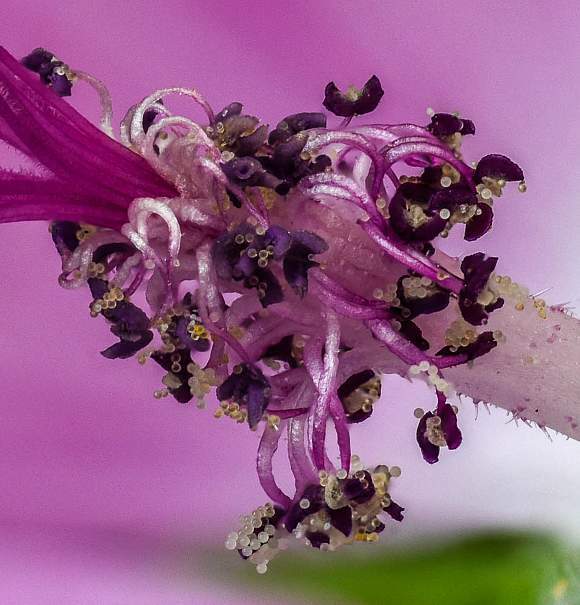 A central column bears a cluster of stamens with purple coloured anthers atop. 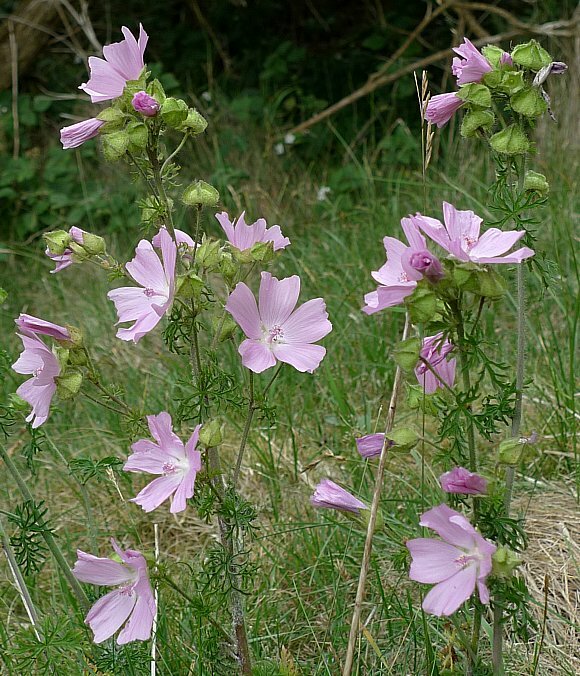 Flower stems are long and thin. 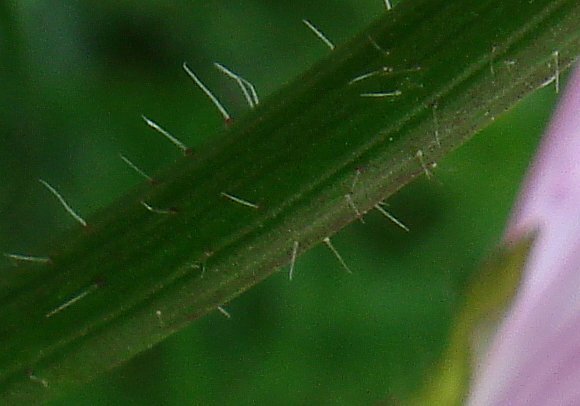 A few straggly long hairs adorn the stems. 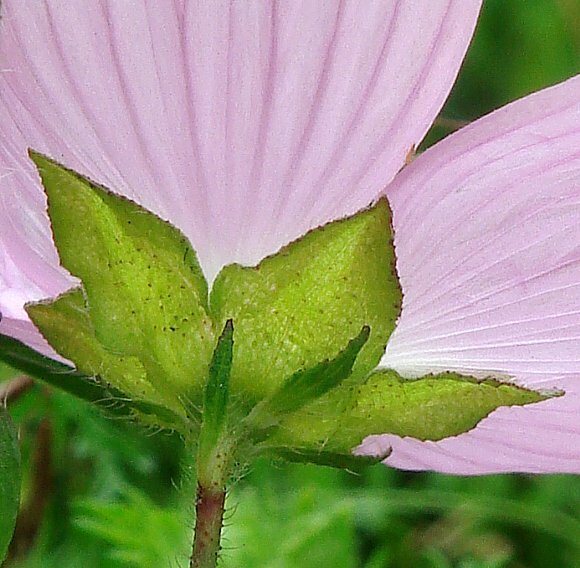 Like all Mallows, it has two concentric sets of five sepals; a broad set cut to just over half-way, and an outer darker, shorter and much narrower set beneath. 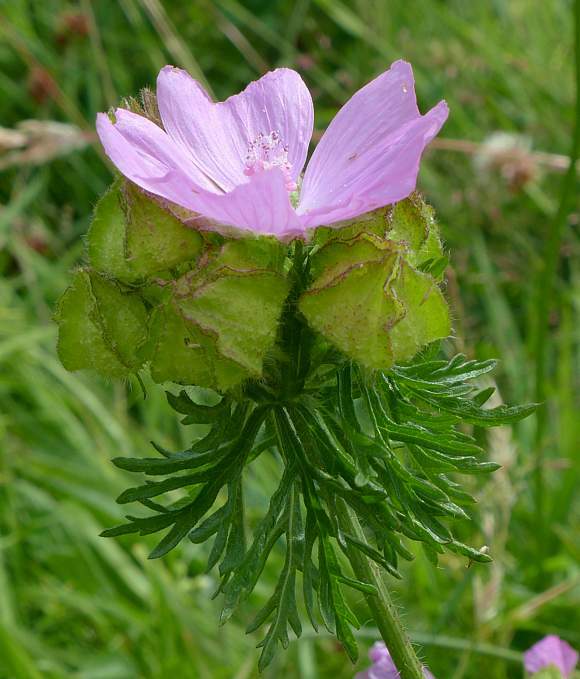 Un-opened flower buds have a conical shape. As it un-folds, the reason for the slight asymmetry becomes apparent. 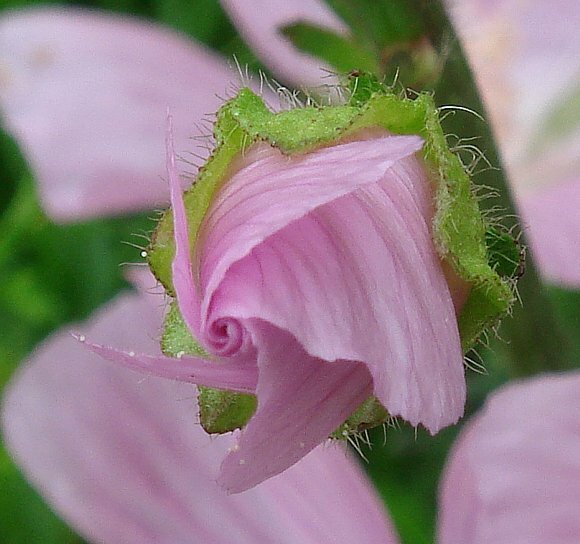 Petals un-furling from a five-lead spiral. 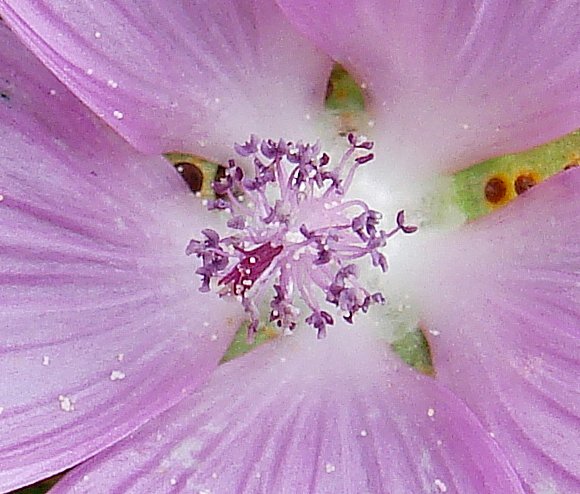 sepals hairy. Leaves deeply and narrowly cut. 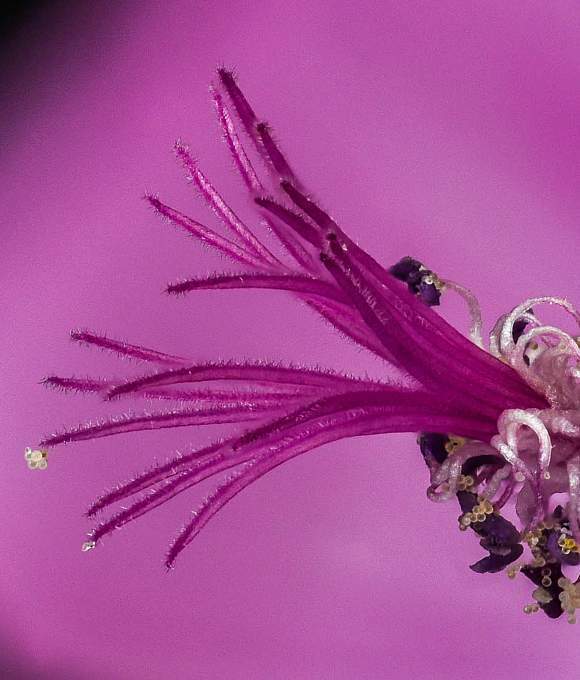 The central thick white style with multiple purple filamental stigmas attached at the end. 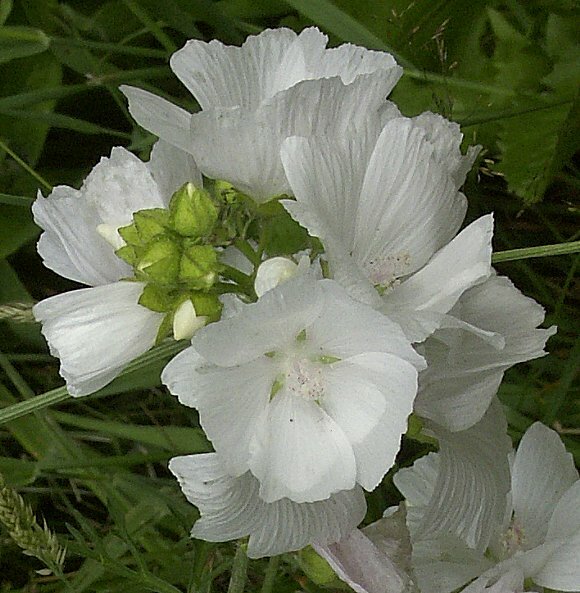 The style is surrounded by a multitude of white filaments bearing indigo-coloured anthers with pale-yellow pollen. 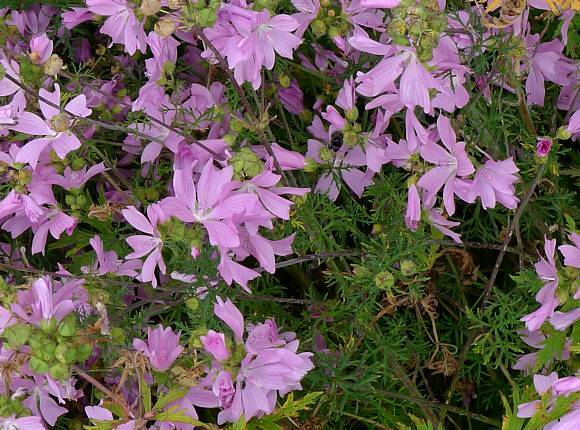 The stigmas are purple, with short hairs and taper to a blunt end. 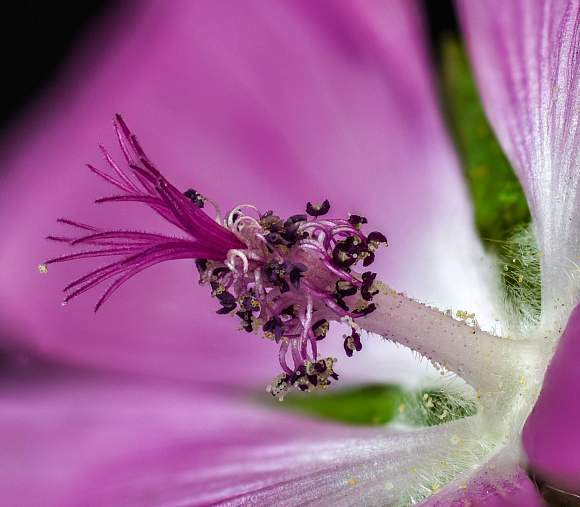 Filaments are white, more numerous than the stigmas and have indigo-coloured anthers which open like a crocodile mouth, within which are tiny globular, clear to pale-yellow translucent pollen grains. Growing in someone's garden, therefore possibly(?) 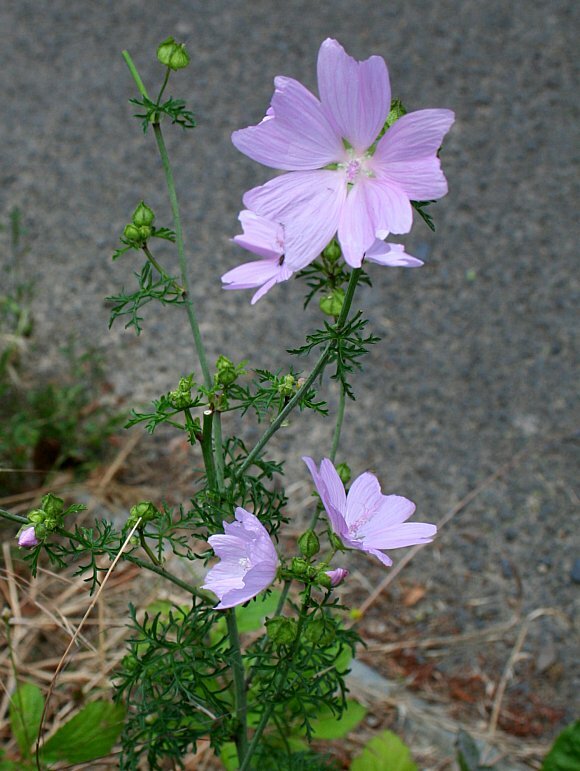 a cultivar variety. 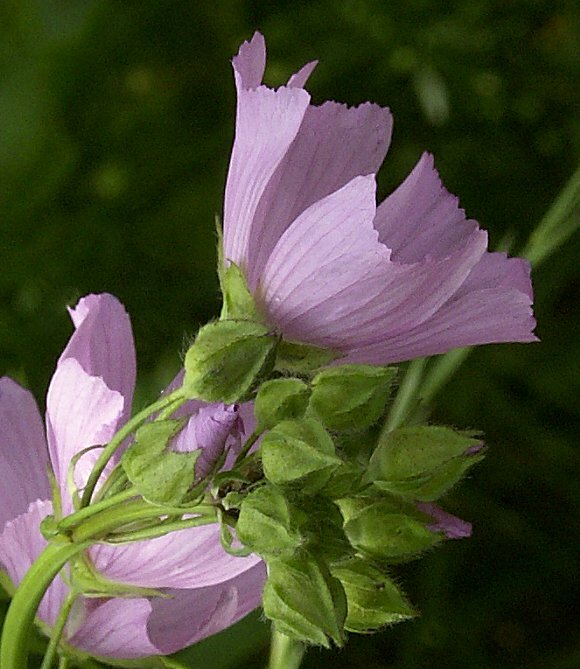 Easily confused with : Greater Musk-Mallow (Malva alcea) which is larger but has stellate hairs, where all the hairs have radiating arms in a star-formation, whereas the hairs on Musk Mallow are all simple. 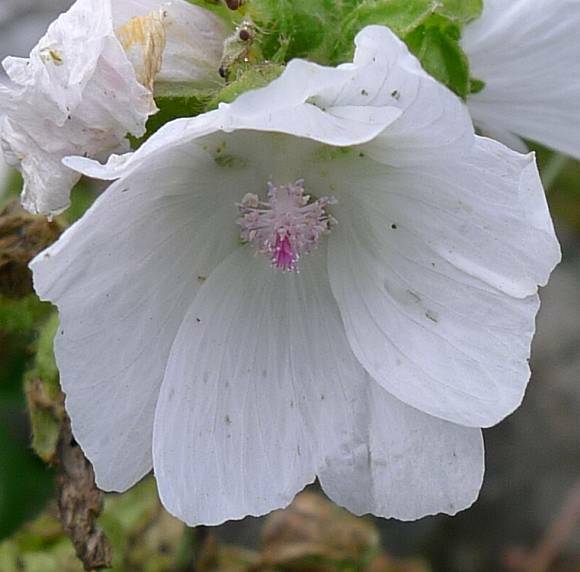 Distinguishing Feature : The Mallow shaped flowers with the finely divided narrow leaves and simple rather than stellate hairs. 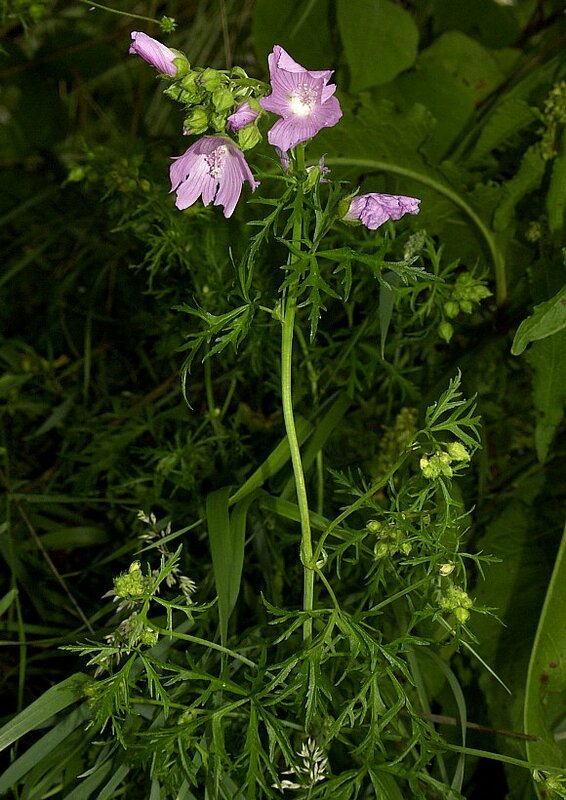 No relation to : Musk Thistle (Carduus nutans), Musk Storksbill (Erodium moschatum) or Musk Orchid (Herminium monorchis) [plants with similar names belonging to differing families].